← The Menagerie is bringing an international flavour to their October show. 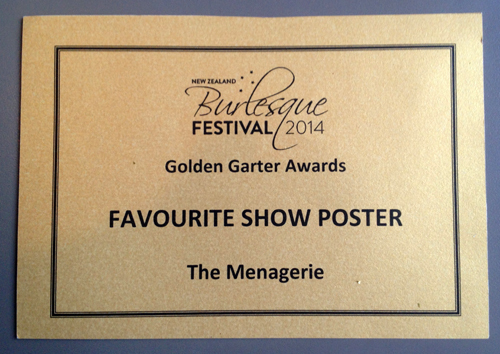 We were very honoured to receive two awards at the New Zealand Burlesque Festival Golden Garter Awards. Firstly for Favourite Show Poster for the fabulous work done by The Juice Lab (who also took away the Favourite Industry Designer award) and also for Favourite Production. We are utterly delighted and tickled pink.